You can help pave the way to a better future for children around the world by hosting a shoe drive. No matter where you live or what you do, you can make a difference in the life of a child by hosting a shoe drive at your school, church, office or club. Your shoe drive helps children like Princess stay healthy and go to school. Princess lives in Busia, Kenya, where she is at-risk for jiggers – a parasite that enters through the feet. She also needs new shoes to attend school. Buckner Shoes for Orphan Souls gives shoes you collect to vulnerable children around the world, providing them the opportunity to learn, grow, and change their lives for the better. One pair of new shoes can change the trajectory of a child’s life. By hosting a shoe drive, you shine hope into children’s lives around the world, just like Princess. 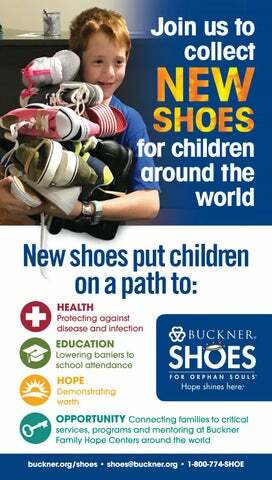 Please visit buckner.org/shoes to register your shoe drive today!